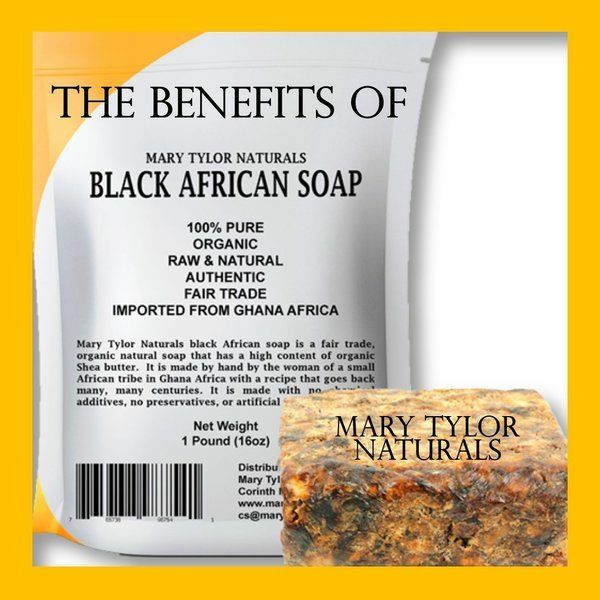 Mary Tylor Natural’s Black African Soap is an all-natural, organic healing and revitalizing soap. It is produced in Ghana using a traditional, healing recipe passed down from ancient generations. Though the recipe can vary from each specific village, African Black Soap is typically made from cocoa pods, palm tree leaves, tree bark and plantains. It can also contain coconut oil, palm kernel oil and shea butter. These ingredients enrich the soap with vitamins and anti-oxidants. This soap is widely used to provide personal hygiene, skin care, UV sunlight protection, minimize stretch marks and treat eczema. Below are some fantastic benefits of African Black Soap! 1- Hygienic- African Black Soap is naturally anti-microbial and anti-septic. Lathering in this comforting soap is a great way to clean your skin thoroughly without exposing yourself to harsh anti-bacterial chemicals. 2- Hypo-allergenic- This soap is beneficial for all skin types whether you have oily, dry or combination skin. African black soap actually balances your skin's natural oil production and helps balance your PH levels. It is also a great exfoliating treatment that gently removes dead skin and toxins from your skin in a safe and natural way. 3- Healthy Ingredients- African Black Soap contains a mixture of ingredients that when blended become a powerful healing recipe that is not only full of vitamins but also anti-oxidants. This soap can help reduce scars, stretch marks and blemishes due to it’s free-radical fighting ingredients. 4- Holistic Remedies- Seven types of fungus such as candida, toenail fungus and athlete's foot have been successfully treated by African Black Soap. African Black Soap has been used for generations to heal a variety of ailments such as eczema, rashes, psoriasis and skin allergies. It has been shown to improve the look of your skin and minimize the appearance of fine lines, wrinkles and blemishes. 5- Humanitarian Support- When you purchase African Black Soap, you are supporting a demographic of women in Ghana who work to provide an amazing, organic product to the world. The benefits of this soap not only improves your skin but also helps provide families in Ghana with a source of income.